Week 14 was the final week of the Women’s AIL regular season. We’ve been monitoring players performance throughout the season and we’re delighted to announce the winners of the three categories we’ve been tracking. We’ll catch up with the players over the next few weeks to present their awards. Huge thanks to Samurai Sportswear who have stepped up to sponsor our Club Rugby coverage and in particular these awards. Read below to find out how the final weekend unfolded. The final round of the Women’s All Ireland League was completed this weekend with Old Belvedere, UL Bohemians and Cooke winning the last league games of the regular season. Check out our report and gallery for Cooke v St Mary’s here. A bonus point away win for UL Bohemians means the ‘Red Robins’ top the regular season league table for the fourth time in as many seasons, securing the first home semi final spot. The ‘D4 Aristros’, Old Belvedere, secure the second home semi final spot. They will host, early league leaders, Railway Union in a D4 Derby, so get on your best bib and tucker if you’re going to watch that one! The 4th play off spot was secured by Blackrock in week 11, who will be looking to one better than the draw they got on their last outing to Limerick. Belfast outfit Cooke secured fifth place after their home win this weekend saw them overtake Galwegians. St Mary’s have had a hard season on their return to the AIL, however their away bonus point at Cooke shows the development of the team, and they are well set to push on even more next season. With all top points scorers scoring this weekend, the table stays the same as what it was. 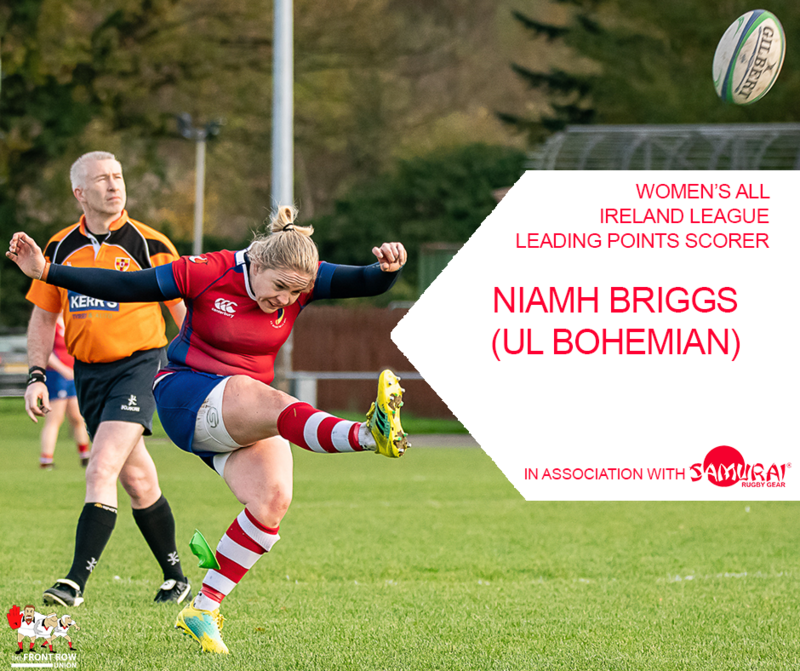 The Woman’s AIL Top Points Scorer is U.L Bohemians Niamh Briggs. The experienced ex-Ireland and Munster player has shown her class throughout this season racking up the majority of her points from her trusty boot, but also showing her ability to score tries. 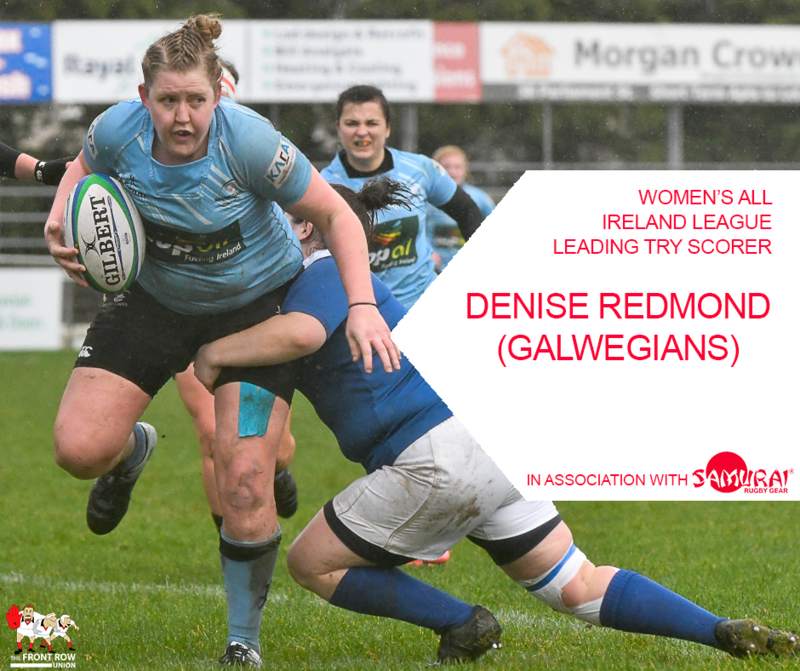 Galwegians Denise Redmond came in close in second place, with the westerner scoring points in every game she played in except one. Early leader Hannah O’Connor, from Blackrock, finished in third, with Ulster and Old Belvedere player Jemma Jackson finishing just out of top three in fourth. Congratulations to Briggsy, and I’m sure she will be looking to score more points for Boh’s during the semi finals and onward. The only change in the top of the table following this weekend’s games is Cooke’s Ilse Van Staden picking up her 6th try. This was enough to finish joint third alongside Blackrock’s Ali Coleman and Ray Lawless, Old Belvedere’s Elise O’Byrne White and Linda Djougang, and UL Bohemian’s Chloe Pearse. Finishing in second place is Railway Union’s Emma Taylor leaving the Women’s AIL Top Try Scorer as Galwegians Denise Redmond, who racked up a total of 8 tries over the 11 games she played. Congratulations Denise, well deserved on a fantastic season! This sees Stapleton and McMahon join Cooke’s Beth Cregan , St Mary’s Ciara Scanlan and Old Belvedere’s Jemma Jackson in third overall. 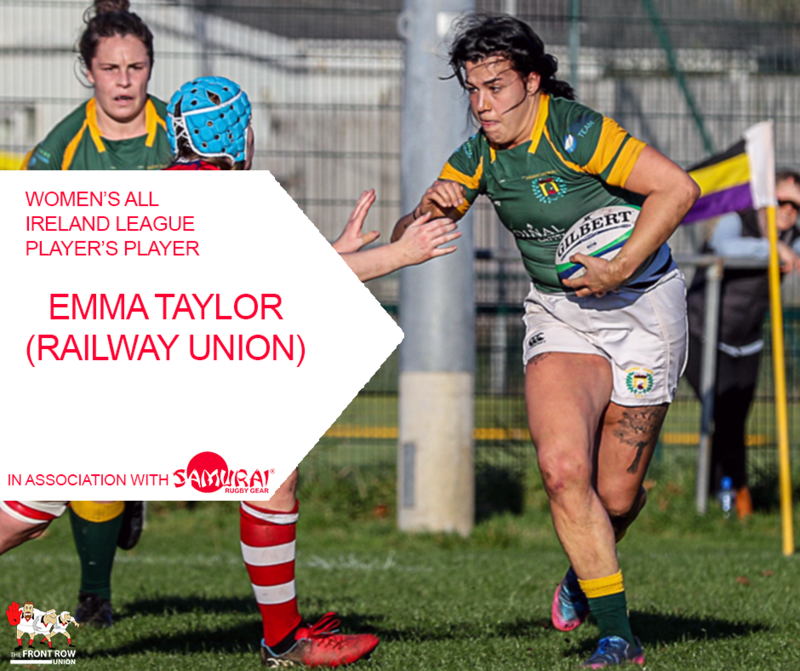 St Mary’s Jet Duinmeijer finishes in second and Railway Union’s Emma Taylor holds onto top spot to win the Women’s AIL Players Player Award for 2018/2019. Previous ArticleMen Six Nations: Who did what?